We are one-step ahead of our competitors in manufacturing and supplying a wide range of Glass Filling Machines. 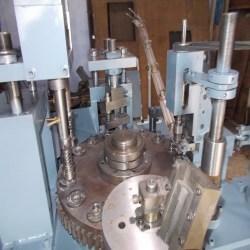 These machines are engineered as per the defined industrial standards. Demands of these machines are increasing day by day owing to its various salient features including less maintenance cost, efficient performance, automatic functionality and durability. These machines are acclaimed for their precise designs and rugged construction. Established in the year 2008, we, "Super Engineering Works" is counted among the market leading manufacturers and suppliers offering a wide array of Industrial Machines. These industrial machines are manufactured using branded components & spare parts and are appreciated for their optimum quality, high performance and long service life. Further, in our extensive range, we offer Bulb Cap Machines. Owing to our hi-tech infrastructure, we have secured a reputed position in the industry. The offered range is in compliance with international quality standards. We have an expert team of professionals that strives hard to enhance the performance of the delivered products. We are committed to supply premium quality products to our clients at reasonable price. For this, we are continuously improving the dealer networking in the market to expand our business. We make use of advance machines and latest techniques in our infrastructure for manufacturing process. Apart from this, we are also equipped with sound R&D unit that continuously monitors the market strategies and trends currently prevailing in the market.